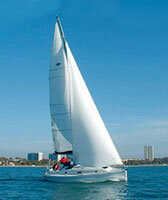 THE SADLER GROUP LTD consists of Sadler Yachts Ltd, Rampart Yachts Ltd and Ocean Quay Ribs. They are based at the Ocean Quay Marina which is a superb location on Southampton Water. Since the Company was placed into administration, Hillyards boatyard a long established company of boat builders and repairers have purchased the assets (moulds and intellectual property) of Sadler Yachts and their plansare to finish four yachts currently in production. In the future, they plan to develop and build to order the hugely popular Sadler 290 and recently developed 340, both designed by Stephen Jones. Hillyards which specialises in new yacht builds, repairs and refits on craft of every construction. Hillyards have been building boats for more than 100 years. Today they offer owners a more bespoke choice of building services together with the stunning Broadblue Catamaran range and exciting Sadler Yachts . Within their 16000 sq ft purpose built boat building facility they complete minor repairs and major refits, as well as manufacturing the Sadler range, and also their range of 10 meter plus, world beating ribs. Following the huge success of the Sadler 290 they are now developing her bigger sister, the brand new Stephen Jones designed Sadler 340. Due for launch in 2008 she is set to take the sailing world by storm. Their yacht building facilities are presently geared to building 16 Sadler 290s a year, but due to increasing demand they will be enhancing their build and fit-out capabilities to increase production to up to 19 Sadler 290s plus 6 Sadler 340s per year. Sadler have also completed the development of the new 920 Grand Tourer cabin RIB and this is now in full production. This powerhouse of a Rib has now been joined by the GT 10 Open, and the GT10 Sports Tourer, all available with diesel inboard, or Mercury Verado outboard engine packages. The Sadler 290 is a revolution in yacht design, combining the go-anywhere practicality of twin keels with the sailing performance of a fin. Steven Jones, the designer and Rampart Yachts have rewritten the rule-book with the Sadler 290, designing what many people feel is the ultimate small cruising yacht and it is now considered to be one of the most significant creations in the nine metre (29 feet) yacht size. Modern construction techniques makes for a strong, lightweight, fast and roomy hull with high quality interior. The Sadler 290 is also spacious on deck. The wide, deep cockpit is totally enclosed and designed for safe and easy handling of sails, whilst at anchor the hinging transom gives access to a bathing platform and ladder. Six full length berths and 6' 2'' headroom makes for real live-aboard comfort and long distance cruising capability. Their original plans for the Sadler 290's bigger sister have grown to optimize her sailing performance and internal volume, now at 34 feet overall length the Sadler 340 promises to be a true blue water cruiser with sparking performance in all conditions . Further information are available on the Hillyards Website www.hillyards.co.uk. The Sadler and Starlight Owners Association (SSOA) was established in 1978. It operates for the benefits of its members and provides a community of interest for owners of Sadler and Starlight Yachts.